It's overused and meaningless, they say. It "epitomizes lazy, and makes people a liar" says Seth Ginsburg, a 29-year-old New Yorker. "Are they really laughing out loud?" Comedian Demetri Martin has joked that he uses "LTMQ — laughing to myself quietly." "It's more honest," he says. I laugh every time I hear that joke — out loud, no less — because I too have this internal debate: I tell myself that I'll only type LOL if I'm really "LOL-ing." But I fail, regularly. It's just too easy to type (two keys, one finger or a thumb, if it's a cellphone), too convenient a response. Sure, there are LOL haters out there, seemingly more all the time. But for better or worse, this modern-day acronym has become ingrained in our lexicon and, for some, has evolved in meaning. "It's brevity at its finest, and it gets a point across," says 25-year-old Arzi Rachman, another New Yorker. Try as some might, LOL will not be easily shaken. The exact origins of this three-letter acronym, in its current form, are not easy to pin down. Most likely, it was a gamer or hacker who first used LOL (or "lol") on an electronic message board, probably sometime in the 1980s. Its use became more common on early Internet services such as CompuServe and Netcom. By the mid-1990s, when even more people joined America Online, the term LOL hit the mainstream in chat rooms and in instant messaging. It morphed, as well. If you thought something was really, really funny, for instance, you might type ROFL — "rolling on the floor laughing" — or LMAO — "laughing my (you know what) off." By 2004, fatigue was setting in. LOL was added to the "List of Words to Be Banished from the Queen's English for Mis-use, Over-use and General Uselessness," updated each year at Lake Superior State University in Michigan. Regardless, LOL went forth and multiplied and has since seeped into spoken language. "At times, I do say LOL," says Rachman, a college student, "usually to accentuate sarcasm, or something along those lines." Of course, when speaking of text conversations, one can't forget the sideways smiley — :-) — which you might call LOL's older cousin. Scott Fahlman, a research professor in the computer science department at Carnegie Mellon University, often gets the credit for first suggesting that emoticon nearly 30 years ago. His fellow academics quickly embraced it and ushered in its everyday online use. The sideways smiley has gotten bashed too — it's been called the equivalent of "i's" dotted with hearts. But asked if he's ever used LOL, Fahlman will tell you, "Nope." He draws the line. "It sort of strikes me as kind of — this is going to sound sexist — a teenage girl thing," he says, "a high school thing." But is that really true? 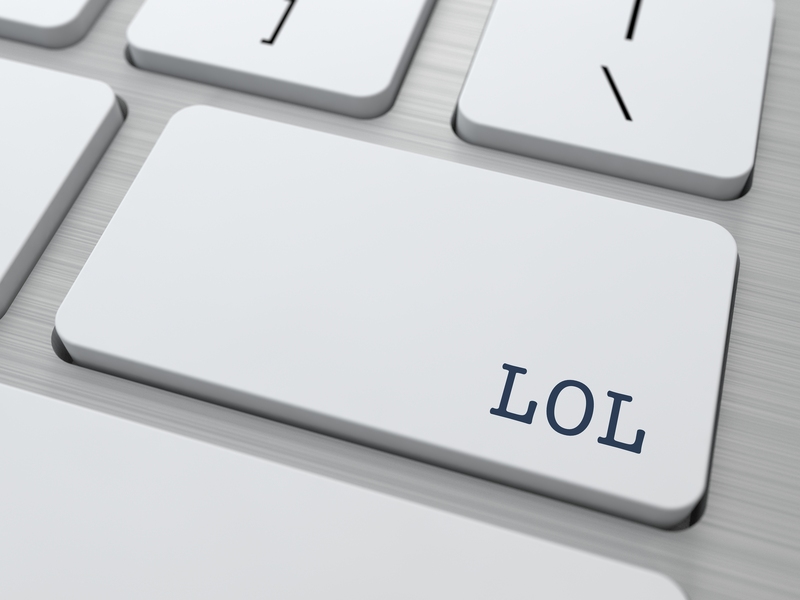 Does the use of LOL really fall along generational lines? Was the implication that some of us are too old to use LOL? "One of the things that's pretty clear — whether LOL is in or passe — it depends on your social circle," says Naomi Baron, a linguist at American University who wrote the book "Always On: Language in an Online and Mobile World." As more people of all ages forge online lives, those social circles may be less divided by generation, though not completely. In surveying college students about their use of online or texted terms, for example, Baron has noticed a difference in the way they use LOL. For them, it is often used as a simple acknowledgment that may have nothing to do with laughter. Instead, LOL might mean "oh," "got it," "heard you" or "really?" That use might bother some people; Baron also has colleagues who scold her when she doesn't correct students who greet her with a "hey!" But she says that kind of evolution in language happens all the time. Sometimes, it's for practical reasons or convenience. Other times, it's simply a style or trend. In the 18th and early 19th centuries in England, Baron notes, it was commonplace to sign a letter using "Yr Hum Serv," an abbreviation for "Your Humble Servant." "Everybody knew what that meant," she says. "It was just convention." Today, it's happening on Twitter with "hash tags" — the number symbol. Originally meant to mark terms or events that users may search for, people have started using hash tags to highlight the equivalent of a funny or snarky side comment. That use has since transferred to Facebook, where hash tags don't even apply. "It's all part of marking your territory," Baron says. "People mark it linguistically. They mark it by dress. They mark it by how many earrings they have in their ears — you name it." All of that makes sense to Ben Huh, who heads the Seattle-based company that oversees popular humor websites such as "I Can Has Cheezburger?" and "FAIL Blog." His sites allow users to share funny videos and photos, which he and his staff call "LOLs" or "lolz." "I don't actually remember the first time I started using this lingo because it seemed to me that it was just part of life," says Huh, who is 33. "I didn't adopt the use of Internet cultural languages. I just grew up with it." So for him, using LOL feels as natural as saying "OK," or "cool." He also couldn't care less if a person who uses LOL isn't really laughing out loud. "It's like the suburban dad who wants to put his hat on backward," he says, "versus the kid who puts a hat on backward because that's just what they do." It's not necessarily a matter of age, he says, but whether it's really just who you are. I've decided that LOL is me, sometimes. Just like I don't send text messages to my mother, because they'd never see the light of day, I probably wouldn't use LOL with my boss or an acquaintance or any number of people who kvetched about LOL when I told them I was writing a story about it. They're more likely to see the buttoned-up purist in me who avoids cliches "like the plague," as one of my college professors once encouraged me to do. But then there's the me who has the urge to wear my pajamas to the coffee shop on a lazy Sunday morning. She uses LOL — and wishes the world would lighten up, just a little. Check out the USA Today article here. Participate in uKnow's Social Media Etiquette Twitter Party to continue the discussion about how LOL and similar terms have shifted in meaning and can cause misunderstandings. The Twitter Party is on Wednesday, April 23 from 1-2 pm EDT. We hope to see you there and hear your thoughts on texting slang like LOL!